IT’S GETTING A BIT NIPPY OUT THERE, as they say. Seems like we went from warm sunny evenings to cold and dark just like that. Even had our first snow on Monday. But that doesn’t stop the PR Fitness club. As we’re fond of saying, there’s no such thing as bad weather, just insufficient gear. Tuesday and Wednesday nights were business as usual. 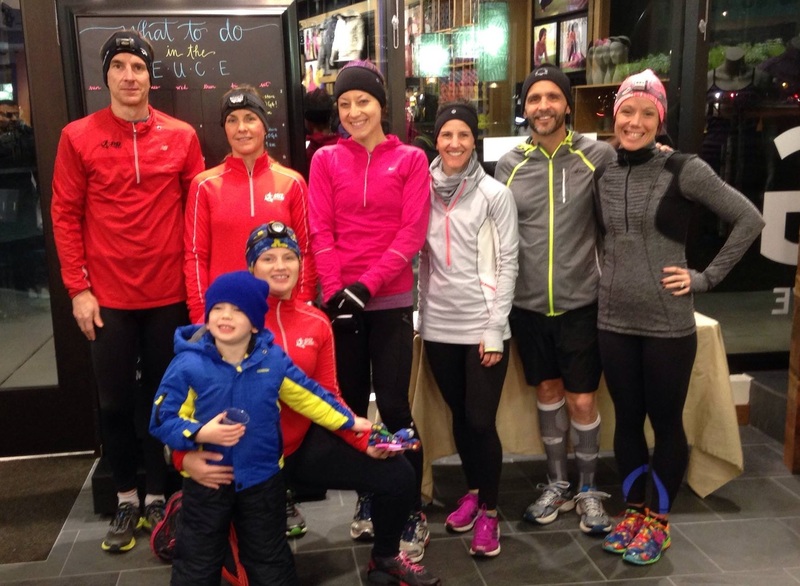 Wednesday night’s group at Lululemon. 34 degrees and dark? Zip up the warm tech shirts, put on the headlamps and hit the road! Cold weather running actually has a few advantages; for example, hard training like tempo runs and hillwork can be easier. I did both Tuesday night, and I was in no danger of overheating. But I overdressed a bit and got sweaty – not good, since as soon as I slowed down, I was wet and cold. Nothing for it but to keep up the pace to the end. Wednesday night, by contrast, was a real pleasure from start to finish. We went out for a steady run at a smooth, casual pace. After a hectic day at work, it felt really good to switch off the mind and put the body into cruise control. During the run I talked with Coach Marie about last weekend’s 10K race at the Ann Arbor Turkey Trot. I’d run a good time – not a PR, but decent – and crossed the finish line feeling I’d given it my best. Knowing a friend was a few minutes behind me, I went to get my camera from the car, and found that I was able to run there and back. This actually bothered me. Had I ‘left something on the course’ after all? Not run as hard as I could? All right, it’s not easy to take this race seriously. But I tried. She told me not to worry. Bouncing back quickly after a short race is normal, as the heart rate gets down. For me to keep improving, I need to train the body to maintain a faster pace. In other words, the only way to run faster is to run faster. She said she’ll get to work on more tempo runs and intervals for me. Me and my big mouth. Chocolate has a longstanding association with runners, and chocolate milk is often touted as the perfect ‘recovery food’ following a race. If so, then the people at the Kona Chocolate Run this Sunday in Plymouth will be in fabulous condition. Runners will get in some healthy morning exercise and celebrate with hot chocolate during and after the run! Sorry, online registration is closed, but a limited number of new slots will become available on Saturday. See the website for details. If you can’t make it to Plymouth, then go running anyway. 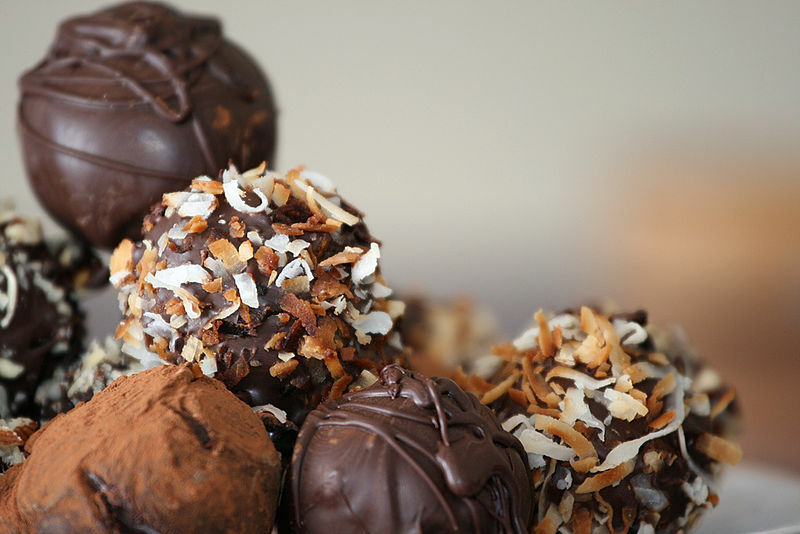 And have some chocolate. For anyone in and around Ann Arbor, I can recommend Zingerman’s hot chocolate, which is sans doute the best chocolate I’ve had outside Paris. Take that, winter! 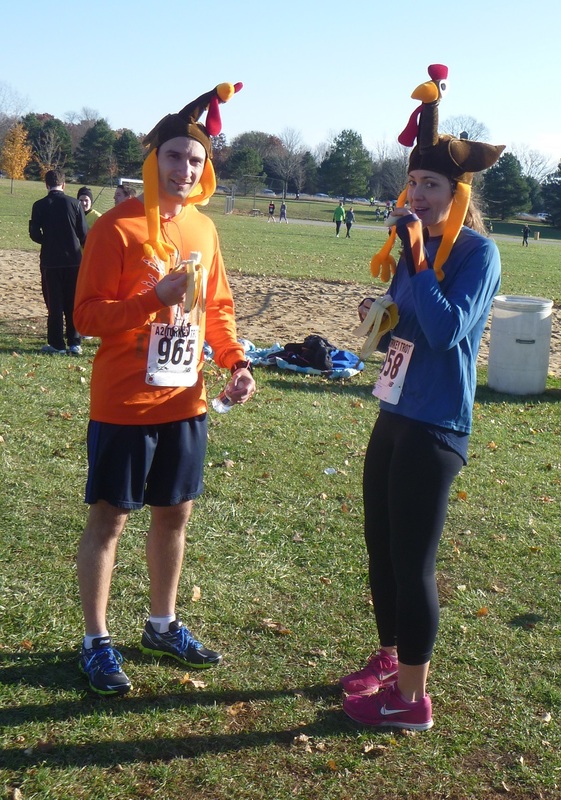 This entry was posted in Running & Cycling and tagged 50, Ann Arbor Turkey Trot, chocolate, cold weather, fitness, Hot Chocolate Run, Kona, PR Fitness, Running, tempo run. Bookmark the permalink. If you’re at Zingerman’s you might as well get a Black Magic Brownie!! It’s brownie heaven!! I was at the Chocolate Run (I was a pace leader), the chocolate was good! It was chocolate fountain dipped pretzels, marshmallows and rice krispie treats! The shirts were also very nice although pacers didn’t get them. Actually, pacers can get a shirt! I picked mine up after the race at the registration area. Try emailing the event organizer – they might have a few left. And yes, the Black Magic brownie is well nigh unbeatable! I have never run a Hot Chocolate run but they have always seemed RIGHT UP my alley! With a moniker like yours, I’m surprised you didn’t fly back here just for the occasion! I’ll let you know what you missed.